My kids and I love logic games and puzzles, as you well know. 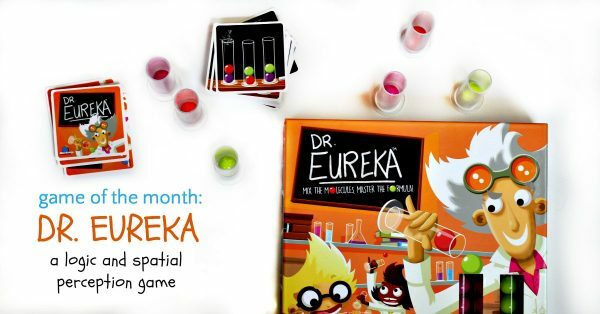 Recently, Blue Orange Games sent us one of their new games, Dr. Eureka Speed Logic Game, to try out. We love many of Blue Orange Games and I have featured several of them as games of the month, such as the preschool memory game Pengoloo or the math-crossword hybrid, Sumoku. As I expected, my kids quickly made friends with Dr. Eureka. 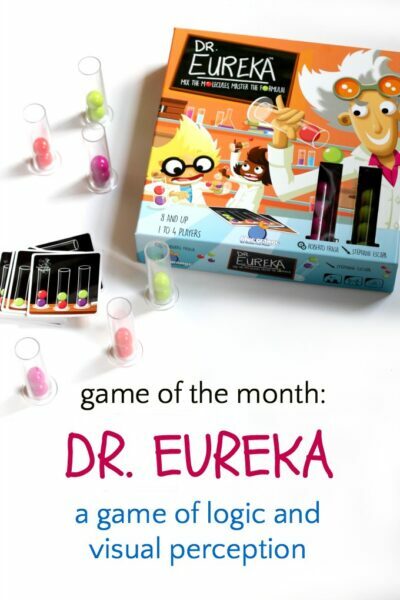 Dr. Eureka Speed Logic Game consists of 12 test tubes, 24 balls in 3 different colors, and a set of challenge cards. The challenge cards display pictures of different combinations of the colored balls in test tubes. As each challenge card is revealed, players race to duplicate the picture on the card, using their test tubes and colored balls. The catch? Players must transfer balls by pouring them from one tube to another. Players cannot pick up balls with their hands, and the balls cannot fall out of the tubes onto the playing surface. The first player to recreate the pattern on the challenge card yells, “Eureka!” and the next round begins. The enclosed instructions describe several variations for game play. Dr. Eureka Speed Logic Game is a fine motor skills workout. It is recommended for ages 8 and up and so younger players, even when they can accomplish the transfers, will quickly be left behind. However, there is no reason to leave them out of the fun as I will get to in a moment. The beauty of this game is that families can adapt it for their needs. My 11 year old was happy to race against me. He also loved doing the challenges by himself. My 7 year old would melt into a pool of frustration if he was pitted against a more skillful player. However, he has spent many an afternoon practicing the transfers on his own and is happy to play against me, knowing that I will play at his skill level. With younger kids at the table, make it a cooperative game. Instead of competing against each other, play in teams, with kids practicing how to give verbal instructions to grown-ups, or vice versa. Giving clear verbal instructions is a highly valuable skill! As you might expect from the name, Dr. Eureka Speed Logic Game exercises the logic centers of the brain. It also gives spatial perception a workout as players must figure out how to transfer balls back and forth between the tubes in such a way as to reach their goal. Sometimes this might require a lot of finagling, or sometimes it can be done in just a few transfers. Because of the restriction that disallows players to drop the balls, players must exercise patience and self-control, while at the same time working on the aforementioned logic and spatial perception skills. Holy executive function skills, Batman! Side note: for you drama queens, (and there is NO ONE in our house like that, ESPECIALLY NOT ME. Nope, that’s not me at all. Not at all. ) it is super fun to pretend to be a mad scientist. Do you love games as much as we do? (I’m not sure that’s possible. But if you think you do….) Subscribe to our weekly newsletter to stay in touch! As I stated earlier, Blue Orange Games sent us a complimentary copy of the game. I never write about products I don’t genuinely love, and the vast majority of games I feature are ones I have purchased myself.